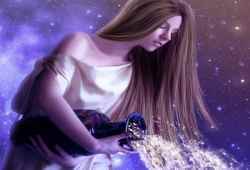 Astrology Love Crush - How to Tell If an Aquarius Woman Likes You? You are here: Home / Aquarius Man / Astrology Love Crush – How to Tell If an Aquarius Woman Likes You? Are you looking for an unconventional girl who is truly ‘out of this world’? Well, congratulations – you’ve found one; that’s, Aquarius woman. As the 11th sun sign in the Zodiac cycle, this constellation is known for being unique, highly intelligent, unapologetically quirky, incredibly charming, and a bit of revolutionary. In real life, this girl is a deep thinker who can’t stop re-inventing herself. An endless stream of unusual ideas always pops up in her mind as she craves for exploring something new. When it comes to relationship, “How to Tell If an Aquarius Woman Likes You” if she’s too exceptional? Most Aquarian girls believe in true love, since they often search for a best friend and soulmate in one. This sign is incredibly friendly and loyal – no wonder they value friendships and respond well to a relationship with a strong sense of companionship, over traditional romance. Attracting an Aquarius woman is not easy: you need to understand and stimulate her witty mind. So, how do you know if an Aquarius girl likes you? She seems to appear cool and aloof in her own world; however, this unique woman is as passionate as any fiery sun sign when she decides to chase her goals. When seeking a right partner, she needs someone whose intellect can match hers perfectly, as well as whom she feels comfortable when being together. The Aquarius women don’t really care about your finances; instead, they’re more interested in your knowledge and charms. Significantly, to win this lovely Water Bearer’s heart, you have to respect her greatest asset – independence. She may be the most unpredictable, unconventional, frustrated and weird person you’ve ever met, but she’s surely the most fascinating too, following Aquarius Woman Characteristics. Being with her, she will surprise you from day to day as this girl knows she’s different from others. As a social communicator, she easily becomes the star of any event, though her close acquaintances may be counted on one finger. Known as the expert at hiding feelings, Aquarius find it hard to reveal their emotions and weakness – things that make them vulnerable later. Is there any difference when an Aquarius woman in love? If she finally finds her true mate, she will naturally remember every little detail about that person and do plenty of tricks to attract his affections. Once being sure about her feelings, she’s likely to devote herself completely for the partner. Another reason why you should date an Aquarius – she totally respects your independence and refuse to suffocate you with emotional demands. In return, you should take your chance to treat this charming girl well, especially after sources of pleasure she provided to you. As the woman representing the future, her ideas are often ahead of her time (some people may think her as a weird, crazy person), but all are NOT bad. Besides, most female Aquarius are experts at expressing their explanations, and they need someone who could understand them until they break through the surface of their exterior personality. Don’t just be a ‘yes’ man; instead, you must express yourself more to gain the Aquarian’s interest. Get to Know Prominent Aquarius Woman Personality to Win Her Heart, also. Still have any idea about “How to Tell If an Aquarius Woman Likes You” topic? Your girl may be ruled by the most complicated sign in the Zodiac, but all the unique traits make her beautiful. Previous article: How Can You Tell If an Aquarius Man Really Likes You?